This hotel enjoys a great location in the delightful surroundings of Agios Nikolaos, in close proximity to the picturesque harbour area. The hotel enjoys ease of access to a host of local attractions, where the essence and intrigue of the area can be uncovered. Guests will be impressed by the charm and elegance that greets them from the moment they step through the doors. The guest rooms are tastefully decorated featuring soothing, natural tones, as well as modern furnishings. The hotel guest rooms provide an ambience of tranquillity and rejuvenation, where guests can experience the utmost in relaxation. The hotel affords guests a number of exemplary facilities, catering to the needs of business and leisure travellers alike. 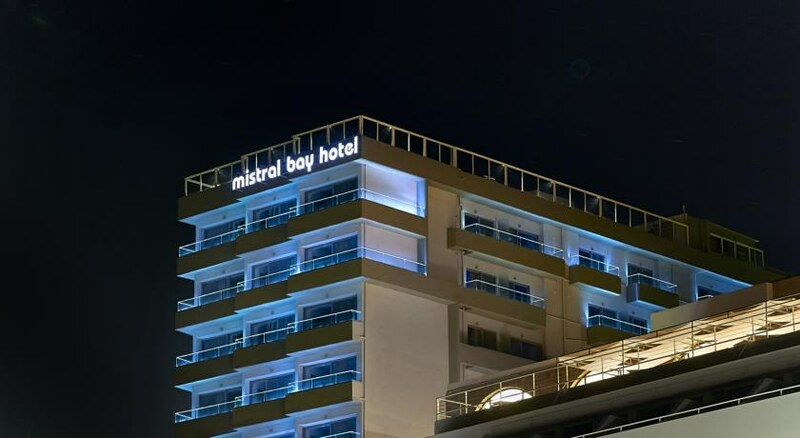 General Description: Welcome to the Mistral Bay Hotel in Agios Nikolaos. 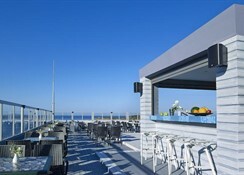 The hotel is located 100 m from the sandy beach. 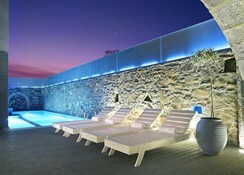 The closest city to the hotel is Agios Nikolaos (500 m). Other cities: Heraklion (67 km). To make your stay more comfortable a lobby, a mini market, an elevator, a conference room, a reception and air conditioning are available. The staff in this 8 storey hotel speaks English, German and Russian. The hotel has a small heated outdoor swimming pool with sunbeds and umbrellas. Refreshing drinks are offered at the pool bar. Distance from the hotel to: Agios Nikolaos Lake (400 m), airport HER (65 km) and disco (200 m). The hotel is within easy reach of shops, tourist information, bars and restaurants, supermarkets, taxi stands, bus stops, medical services and city centre. For your entertainment the hotel features a TV lounge. Vehicles may be parked in the parking lot. Amenities: For convenience the following services are offered: babysitting, currency exchange, ironing service, wake-up service, laundry service, maid service and a safe. 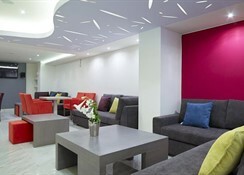 Internet access is provided in internet rooms and at wifi-hotspots. 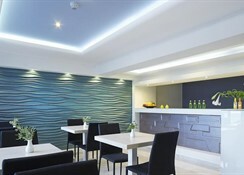 This family friendly hotel offers babysitting service to ensure a comfortable stay for parents as well as young guests. Reception hours: 24h Service. Meals: Breakfast is provided in the following variations: Buffet, American. 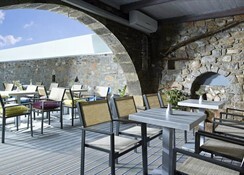 Guests are welcome to enjoy their meals at the restaurant. A snack bar is also available throughout the day. Evening drinks can be enjoyed at the lobby bar. 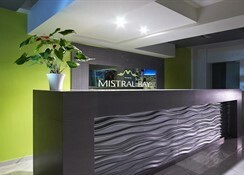 Sport and Leisure: At Mistral Bay Hotel recreational amenities include massages. Guests who wish to be active on holiday can enjoy activities such as exercise in the fitness room. A variety of activities are provided by the hotel such as darts. Additional Information: The following payments are accepted: Euro/Master Card and Visa Card. Additional fees may apply for certain facilities, amenities or activities.